At the American Academy of Child and Adolescent Psychiatry (AACAP) annual meeting in Toronto in October 2011, there was a symposium on risk and resilience factors in the onset of bipolar disorder in children who have a parent with the disorder. Amy Garrett reported that family focused therapy (FFT) in those at risk for bipolar disorder was effective in ameliorating symptomatology compared to treatment as usual. Family focused therapy, pioneered by Dave Miklowitz, PhD of UCLA involves three components. The first component is education about the illness and methods of self-management. The second is enhancement of communication in the family with practice and rehearsal of new modes of conversation. The third component is assistance with problem solving. In Garrett’s study, 50 children aged 7 to 17 were randomized to family focused treatment or treatment as usual. These children were not only at high risk for bipolar disorder, they were already prodromal, meaning they were already diagnosable with bipolar not otherwise specified (BP-NOS), cyclothymia, or major depressive disorder, and had also shown concurrent depressive and/or manic symptoms in the two weeks prior to the study. At baseline, compared to controls, these children at high risk for full-blown bipolar disorder by virtue of a parental history of the illness showed increased activation of the amygdala and decreased activation of the prefrontal cortex. Most interestingly, after improvement with the family focused therapy (FFT), amygdala reactivity to emotional faces became less prominent and dorsolateral prefrontal cortical activity increased in proportion to the degree of the patient’s improvement. The discussant for the symposium was Kiki Chang of Stanford University, who indicated that the results of this study of family focused therapy were already sufficient to convince him that FFT was a useful therapeutic procedure in children at high risk for bipolar disorder by virtue of having a parent with a history of bipolar illness. Chang is now employing the therapy routinely in all of his high-risk patients. Editors Note: This is an extremely important recommendation as it gives families a specific therapeutic process in which to engage children and others in the family when affective behavior begins to become abnormal, even if it does not meet full criteria for a bipolar I or bipolar II disorder. FFT also meets all the important criteria needed for putting it into widespread clinical practice. Family focused therapy has repeatedly been shown to be effective in adults and adolescents with bipolar illness and now also in these children who are prodromal. The psychoeducational part of FFT is common sense, and dealing with communication difficulties and assisting with problem solving also have merit in terms of stress reduction. Finally, this treatment intervention appears to be not only safe but also highly effective in a variety of different prodromal presentations of affect disorders even if children do not meet full criteria for bipolar disorder. While the few studies of early intervention with psychopharmacological agents have not yet identified efficacious medications for the prodromes of bipolar disorder and in particular medications with a high degree of safety, such family focused therapy appears to be an ideal early intervention. I would concur with Dr. Chang’s assessment. Family focused therapy (FFT) should be offered to all children with this high-risk status who have begun to be symptomatic. Early onset of unipolar depressive disorder or of bipolar disorder carries a more adverse prognosis than the adult onset variety and thus should not be ignored. If more serious illness is headed off early, it even raises the possibility that the full-blown illness will not develop at all. Ish Bhalla reported at the 57th Annual Meeting of the American Academy of Child and Adolescent Psychiatry (AACAP) in October 2010 that children with autism have greater thalamic volume than normal controls. Other posters presented at the meeting showed that patients with autism spectrum disorders have connectivity abnormalities, with increased connectivity of neurons to other nearby neuronal groups and decreased connectivity of neurons to areas of the brain at a greater distance. Editor’s Note: These findings echo reports that the corpus callosum, the main structure connecting neurons across the two hemispheres of the brain, is smaller in autism. In addition, other investigators have reported abnormalities in cortical column structure in autism. Interestingly, the findings of increased volume and altered connectivity may even be reflected in measurements of brain and head size. 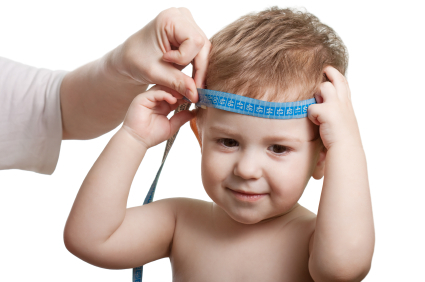 A substantial literature supports the observations that children with autism have greater initial head size and growth of their heads compared with the normal infant population.